Little Marie Heurtin is an imprisoned soul. Born blind and deaf in late 18th-century Poitiers, she reaches toward sunlight like a flower. Now 14, she sniffs and howls like a dog, letting no one but her father touch her. 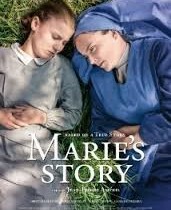 Marie is deposited at a school for deaf girls, where Sister Marguerite (marvelous Isabelle Carré) takes on dual challenges of communicating and taming her. Marguerite refuses to let her own debilitating lung condition constrain her, grappling with her young charge to the point of exhaustion. Literally tethered to one another, the women engage in a very physical battle for understanding. How to explain that there is a word for every object, much less the concepts of music or death or God? Gradually Marguerite introduces Marie to the wonders of the world, where all living things pulsate under their fingers. Newcomer Ariana Rivoire is absolutely riveting, imbuing Marie’s Story with life and love.